The Fort and Shalamar Gardens in Lahore are masterpieces from the time of the Mughal civilization. The Shalamar Gardens were built by the Mughal emperor Shah Jahan. Construction of the Persian-style garden began in 1641 A.D. and was completed the following year. The Gardens have been laid out from south to north in three descending terraces. To irrigate the Gardens, a canal named Shah Nahar (Royal canal) was constructed. It also feeds the 410 fountains. The site was added to the Danger-list because the outer walls and hydraulic works of Shalamar Gardens are in urgent need of repair. We arrived at Lahore Fort’s main Alamgiri gate to find it firmly closed for the next 3 days. The army had taken over, both to protect it from Taliban attacks (one was imminently expected by the government in retaliation for their “allowing”, as the Pakistani Taliban see it, US drone attacks such as the one which had recently killed their leader) and as a holding place for troops kept in reserve in case of sectarian riots in Lahore during the last 2 days of the Muharram festival. So what to do? 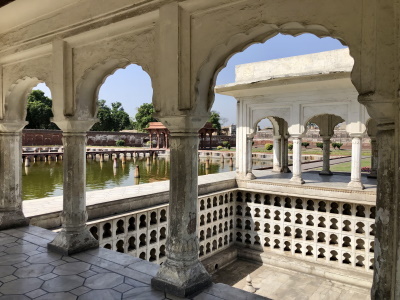 Well – we could still “claim” the WHS by visiting the nearby jointly inscribed Shalimar Gardens which, we understood, were still open, but it would be a shame to miss out on the Fort. Pleas to the guards on a side door we found open were to no avail – we persuaded them to phone their commander with our passport details but “no go”. Now, experience has taught me 2 things when faced with travel problems – don’t give up but wait around at least for a while, the situation might change and new opportunities might emerge. Also, be proactive in a friendly, helpful manner. Sure enough, a few jeeps and cars later a staff car drew up containing a senior officer. The situation was explained, together with our “sincere and significant desire” to see this example of Pakistani history (we might have even allowed an impression to gather which exaggerated a bit our importance as potential diplomats/VIPS – after all what other Westerners would be travelling at this time in Pakistan?). Success - we were to be allowed in, accompanied by a soldier and a chowkidar. Only 2 conditions – we paid the normal entrance fee and took no photos, though this latter restriction was then changed to “take no photos of the soldiers”! Neither was an unreasonable request. Thus it was that we had the tourist areas of Lahore fort to ourselves that morning! As it turned out, the Fort was very reminiscent of what I remember at the Delhi Red and Agra Forts. Hardly surprising, since all 3 are, in essence, Mughal structures. The main structure of Lahore is a bit earlier, having been created by Akhbar (reigned 1556-1605), whereas those of the other 2 were creations of his grandson Shah Jahan (reigned 1627-58). Shah Jahan’s architecture is generally regarded as being the pinnacle of the Mughal style but the general layout and the succession of courtyards, halls and marble pavilions is very similar across each. The piece de resistance at Lahore is the Shish Mahal (Mirror Palace). This in fact was a Shah Jahan creation (indeed Jahangir and Aurangzeb also added their own aspects to Akhbar’s structure of 1566 - itself a rebuild of a fort which had long occupied the site and had been destroyed by the Mongols in 1241). The Shish Mahal has been recently re-opened during continuing conservation project paid for by Norway (which in its terms has a significant Pakistani immigrant population). See photo. b. The hydraulic works at the gardens had in no way been repaired. The true history of what had happened to those works back in 2000 was however made clear - “The accidental destruction of 2 of the 3 hydraulic works and related walls of the Shalimar Gardens for widening of the Grand Trunk Rd……”!!! So it was that the removal from the endangered list was made in part because “the foundations of the water tanks (are) .. protected and consolidated as archaeological sites” – rather less than the original vision. We were travelling with Isobel Shaw’s (excellent) “Pakistan Handbook” of 1989 and in it she notes “The best times to visit the gardens are when the fountains are playing: 10 – 11 am ad 4-5 pm in summer and 11am to 12 noon and 3-4 pm in winter”. Unfortunately the fountains will not have played for a long time and from what we were told by a chowkidar are unlikely to play again for a long time either as the machinery is completely broken (quite apart from the loss of 2 of the tanks of water “accidentally”!). Otherwise the gardens seemed in a reasonable condition and were a place of relaxation for Lahoris. The lack of fountains and of water in most of the garden’s water channels is a major loss. Water is currently present in only the tank of the middle terrace (the Gardens consist of 3 terraces each slightly lower than the other) and that had a rather sickly green colour. Nevertheless the gardens and associated royal buildings are worth visiting. These include the Shah’s sleeping quarters together with those of the empress and various reception halls/pavilions - all in marble. One little building of interest to me which post-dated the main structure was a small guest house built by Ranjit Singh. Now signed as “The Moor Craft building” (sic) it was the place where the explorer William Moorcroft stayed in 1820 whilst gaining permission from Ranjit Singh to cross his territory on the way to Ladakh, Kabul and Bokhara – ostensibly to buy horses but also as an early aspect of the “Great Game”. As a veterinary surgeon (he looked after the East India company stud in Calcutta) he was apparently able to act as doctor to the Sikh (and sick!!) ruler and was made welcome for some time. Moorcroft died in Turkestan in 1825 – unfortunately I have been unable to discover a 3rd WHS with which he was associated in order to create a “Connection” for him! The Lahore Fort, I visited Nov./03, predates the Turkish ruler Mahmud of Ghazni in the 11th century. It was destroyed and rebuilt on several occasions until the great Moghul emperor Akbar replaced the mud walls with solid brick masonry in 1566 extending the structure northwards. Later his offspring Jehangir, Shah Jehan and Aurangzeb added modifications of massively fortified walls. I strolled over to the Diwan-e-Aam or Hall of Public Audience, built by Shah Jehan in 1631-the same year he started the Taj Mahal. From there, the emperors were able to look down on the common people and make their rulings. Wealthier citizens met their emperors on a level floor-Diwan-e-Khas. On the north side is Shish Mahal -Palace of Mirrors. Noble buildings, withstanding the test of time. I visited the Shalimar Gardens with locals, so I didn't pay the foreigner's fee late November/2003 and they were worth the visit. The walls and floors were hand carved and made of marble and sandstone. There is no support for the ceiling, made of huge blocks of sandstone. The construction was well planned for acoustics. An artificial waterfall operates during the tourist season.. Nearby is a marble enclosure with a seat where Shah jahan sat. The guide spoke only Urdu so the locals translated for me. He charged too much for his fee and the locals told me I should not have paid him less the the Rs. 200 he demanded. I am 69 years of age and travelled there to visit some cricket friends and the old Indus Valley civilization sites. Located centrally in the city of Lahore, the Lahore Fort is a magnificent fortified palace complex. Dating from the 16th century, its elaborate Moghul architecture is straight out of a storybook of the Mysterious East. The impressive twin-domed entrance leads into elaborately decorated courtyards and pavilions with water features, some with still intact sumptuous wall decorations of inlaid semiprecious stones and painted designs. There's even a flight of stone steps specially built for ceremonial elephant processions. The Fort is directly opposite the beautiful Red Mosque which can easily be seen in the same visit. The Shalimar Gardens are a separate attraction located several kilometres away in another part of Lahore. "Many of the site's monuments have ... been restored. Better drainage and planning have also improved the preservation of the site's external walls and solved problems of dampness." Chahar Bagh Gardens: "Shalimar Gardens constructed by his great grandson, the aristocratic Shah Jahan, is the epitome of Mughal garden design, incorporating the paradisical chahar bagh, nahr (water channels), waterfalls and tanks, along with terracing and beautiful pavilions, creating a world of its own within its lofty enclosing walls." Harem: "The Shish Mahal or Hall of Mirrors in the Lahore Fort. 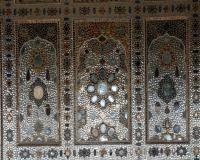 The walls are adorned with intricate tile work inlaid with mirrors. It is part of the Naulakha enclosure that served as a pivate quarter or Harem for women"